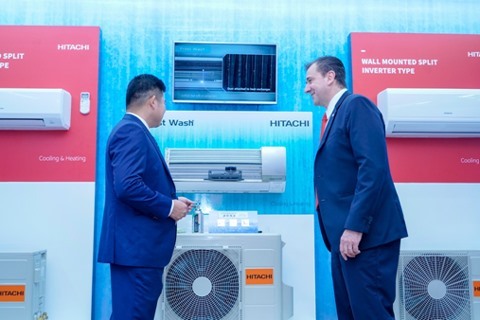 Hitachi is one of the most popular brands in Vietnam, which is perceived as an attractive market for air-conditioning with its impressive population of 95 million people. The establishment of new sales company Johnson Controls-Hitachi Air Conditioning in Vietnam proves that this company is very aggressive in the pursuit of acquiring a certain market share. In mid-October 2018, Johnson Controls–Hitachi Air Conditioning partnered with Thang Uy group (TUG) to officially form a sales company. On one side is a global manufacturer of air-conditioners that was established in Japan in October 2015 as a joint venture between Johnson Controls International and Hitachi – two companies whose products have been strictly verified and have been operating in the global market for over 100 years. On the other side, TUG is an official distribution channel of corporations concentrating on manufacturing top quality equipment with almost 20 years experience of distribution in the domestic market. These two big companies cooperating are promising to exert an enormous impact on the Vietnamese market. According to Johnson Controls-Hitachi Air Conditioning, this new sales company will provide a wide range of air-conditioning solutions in Vietnam, from highly energy-efficient commercial and residential air-conditioners to high-power cooling equipment, and other related services. With 80 employees, most of them Vietnamese, this company possesses a service network in 64 provinces and opens product-training center for educating technical staff. 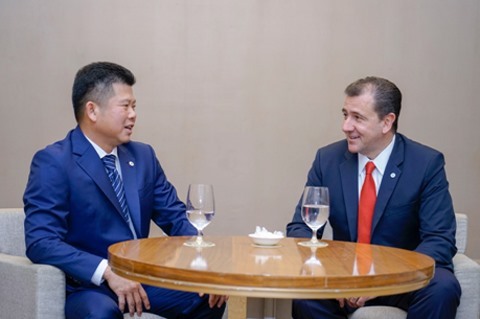 “We have been planning to directly penetrate the Vietnamese market before, and now is the right time,” said Mr. Franz Cerwinka, Chief Executive Officer of Johnson Controls-Hitachi Air Conditioning, revealing the reason for appearing in Vietnam at this time. According to Mr. Franz Cerwinka, Vietnam is one of the most active Southeast Asian markets. The establishment of this new sales company reflects not only the effort of strengthening his company’s sales network in Southeast Asia but also expanding its impact in the international market. A report form TechSci Research indicates that the Vietnamese air-conditioner market is predicted to increase 14.64% on average annually from 2016 to 2021. With that potential, possessing a company to control sales, after-sales, etc., along with developing a distribution channel must be achieved. The newly established company will be lead by General Director Nguyen Quang Hien, who also holds the position of president of council members and general manager of TUG. He reveals TUG has been distributing Hitachi air-conditioners for more than 20 years, including all product lines consisting of commercial air-conditioners, industrial air-conditioners, infrastructure-cooling systems, etc. In that context, establishing a partnership with TUG is perceived as a long-term strategy of both Hitachi and TUG to provide the best service for their customers. To successfully implement it, we will set up training centers for Hitachi air-conditioners in Hanoi and Ho Chi Minh City to improve and provide the latest knowledge for national technical staff. After that, developing and expanding distribution channels as well as warranty and maintenance systems in all provinces will be executed to meet customers’ demand as quickly as possible. “Compared to other electronic devices, air-conditioners require regular cleaning and maintenance services. By providing this, the brand will retain customers,” said Mr. Hien. 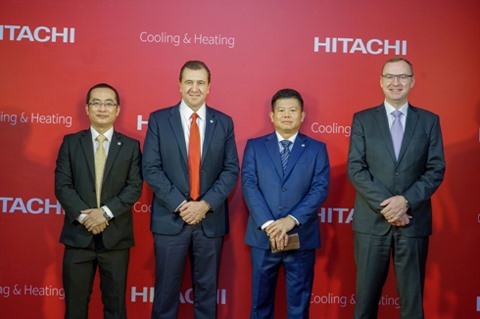 According to Hien, Johnson Controls-Hitachi Air Conditioning Viet Nam has set a sales objective of up to 88 million USD by 2023. This figure puts pressure on sales people and requires them to find new strategies to gain advantages in this market. “Besides investing in distribution systems to access end-users, we will establish relationships with design consultants and M&E contractors to develop demand for high-powered centralised air-conditioner systems for new urban areas as well as demand for centralised cooling systems in public constructions. These strategies will support Johnson Controls-Hitachi Air Conditioning to gain more achievements in the future,” said Mr. Hien.